I am loving all these newly appreciated oils, butters, and herbs that curlies, coilies, and wavies are gravitating toward for their tresses and skin. Embracing your hair in its natural state has brought out the best in many of us as we enjoy what the earth has to offer to care for our bodies. It is no wonder we see so many naturals with gorgeous tresses as they connect with home grown goodness. I love it and yucca has recently sparked my interest. 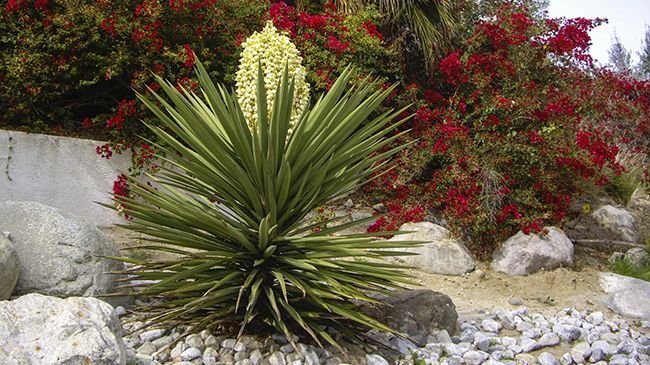 Yucca is a plant which grows in the Southwestern deserts in the United States and some parts of Mexico. It looks similar to the aloe plant with its spiky leaves. Yucca is a genus of perennial shrubs and trees in the Asparagaceae family. Yucca root is high in vitamin C, dietary fiber, potassium and folate. The various types of yucca are widely utilized in alternative remedies in Native American health solutions. According to Skin Care Guide, it is widely used as a remedy for hair loss or hair thinning. It is not a cure for baldness but the root extracts will stimulate the scalp. The ingredient is most effective as a scalp treatment because it contains saponins, which are cleansers that also reduce inflammation, itchiness, and dandruff that some suffer in their scalp. It is not recommended for long-term use because it can cause skin irritation and as always consult a physician before trying alternative methods for hair or scalp ailments. If you are not a DIY'er or just would rather purchase this wonder root already in a product here some popular ones to give a try. Water, aqueous extracts of neem, turmeric root, St. John’s Wort, red sandalwood, and yucca glauca**(yucca) root create a no foam shampoo free of parabens, silicones, and sulfates. This shampoo takes a gentler approach to cleansing and removing dirt without disturbing your scalp’s natural balance. If you are an oil lover then you will like enjoy this conditioner! Not only is it moisturizing but it will strengthen your curls with its keratin amino acids, hydrolyzed wheat protein, and hydrolyzed wheat starch. Deionized water, shea butter, coconut oil, mango seed butter, avocado oil, olive oil, aloe barbadensis leaf extract, ammonium salt (conditioner), and yucca filamentosa extract make up this deep penetrating masque for fine hair. Full of strengthening and moisturizing properties, your hair will feel healthier. This hair lotion is chock-full of natural love! If you are looking for moisture, this is your go-to! The ingredients include water and glycerin (humectant) for moisture and hydrolyzed soy protein, hydrolyzed wheat protein, and hydrolyzed wheat protein for strength. Wondering about slip? Not an issue, as this contains coconut oil and safflower oil. Do you use products with yucca?